Today, we will show you, How to install Let’s Encrypt on CentOS 7 with Apache. Let’s Encrypt is a completely free and automated, new certificate authority developed by the Internet Security Research Group (ISRG) and recognized by all major browsers. They make it a breeze to set up TLS certificates for your web server. And for free! Let’s Encrypt is supported by major players like Mozilla, Akamai, Cisco, the EFF and managed by the Linux Foundation. Let’s Encrypt provides free, automatic and secure certificates. The website owners can easily obtain security certificates within minutes, enabling a safer web experience for all.In today’s tutorial we are going to learn how to install a Let’s Encrypt SSL certificate on CentOS 7 with Apache, and configure the certbot for automatic renewal. Remember to change “test” for your site’s name. Now that we have Apache installed we can continue by installing certbot. Now we are going to add a cronjob so our Let’s Encrypt SSL certificates can be renewed automatically. Now you should have successfully installed and configured Let’s Encrypt with Apache. 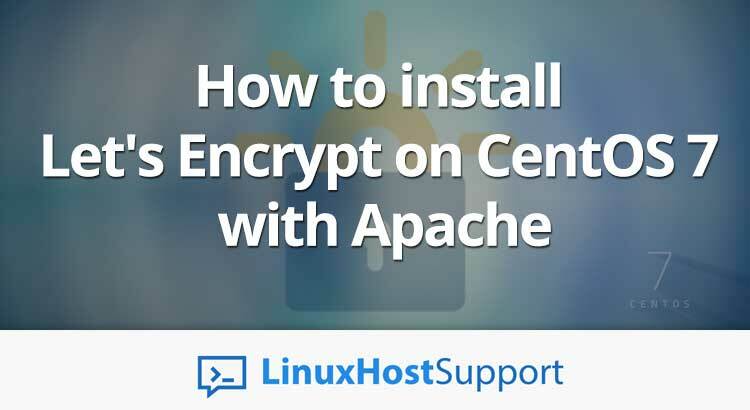 Of course you don’t have to install Let’s Encrypt on CentOS 7 with Apache, if you use one of our outsourced Linux server support services, in which case you can simply ask our expert Linux admins to install Let’s Encrypt SSL certificate on your server with Apache. They are available 24×7 and will take care of your request immediately. PS. If you liked this post, on how to install Let’s Encrypt on CentOS 7 with Apache, please share it with your friends on the social networks using the buttons on the left or simply leave a reply below. Thanks.